Do You Have an Olympian? Dogs are naturally competitive. They like to race one another, play tug of war (hopefully not with your winter scarf), and otherwise run around and enjoy being a dog. Many of us are familiar with dog shows, often designed to demonstrate training, style, and good cooperation between owner and pet. However, there’s another way your dog can show off their skills in a different way. We’ve enjoyed the Olympics for years, watching the world’s greatest athletes compete through physical and mental obstacles to claim gold. But, there is another Olympic event completely dedicated to our four-legged friends- the Dog Olympics. What are the Dog Olympics? 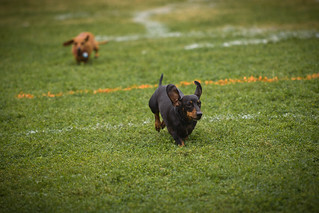 Much like the Olympics we’re familiar with, these events are designed to test both dog and owner skill and cooperation. Amongst the events you may encounter are high-flying disc routines, head-to-head weave pole races, and even dog diving trials (for those that enjoy a good swim). Others are far more in-depth, much like the triathlon designed to test agility. Here, the dog navigates an obstacle course of tunnels, ramps and weave poles, while taking cues from the trainer to help guide them on the right path. Not every dog can become a national qualifier for the USDAA competition though. It’s an invitation-only event that often takes years of training to qualify for. But, that doesn’t mean there aren’t other Olympic events you can’t take part in. Some are as extravagant as the Canine Max Dog Olympics, which take place in Llanelli, South Wales this year. But others are far more local, if you keep your eyes and ears out. Working at the park is one of the best ways to start preparing your dog to be an Olympian. One of the biggest tests, one that we don’t think about when it comes to testing agility and skill, is that the crowd-factor plays a big part in your dog’s attention. Being able to handle your dog in a crowded environment is very important, not just for Olympic achievement, but because it helps keep them safe when you’re out and about. Naturally, the act of keeping your dog active is important to their health and endurance. While your dog might be agile and strong, how long can they keep it up? Is their heart and circulation healthy enough to keep them going throughout the day when faced with prolonged activity? Many dogs spend a great deal of their time hanging around the house, often becoming a couch potato while you’re away at work. Activity games, especially puzzles and mental challenges, will help keep your dog active, even when you’re not there. Working on their advanced training and skills, such as catching and retrieving (do they bring it back to you afterwards?) should be on your list of Olympic challenges. Keep in mind that this isn’t just a test of your dog’s abilities, but also a test of the cooperation and bond that you both share. It’s important that your dog respond to you effectively, even when there are distractions all around. Such skills would include “staying” in a difficult position, such as a balance board, or weaving properly through a channel and avoiding knocking over any of the cones (dogs as drivers?). What about local Olympic situations? While some cities do host their own Dog Olympic events, you don’t have to be a nationally sanctioned body to enjoy the fun and entertainment this type of event presents. With the help of some of your fellow dog owners, you can set up a challenge course for dogs at the local park and invite others to take part in the fun. In fact, most dog parks actually have a number of these athletic devices available. Tunnels, pole runs, and even balance boards can be turned into friendly competition. When it comes to disc tosses, all you need is a Frisbee and someone to throw it. And as your venture begins to grow, you might even gain the attention of some outsiders in the future, and potentially a few nationals who appreciate the abilities of the participants. Just be sure that everyone there understands the meaning of friendly competition- it’s never something to get upset about. Don’t be discouraged if your dog isn’t the fastest or strongest though. After all, they really don’t care about that at all. They just enjoy the fun of the experience and the time they get to spend with you and their friends. Perhaps that’s a valuable lesson dogs hope everyone will someday learn.